Many baseball historians unanimously consider the 1927 New York Yankees as the best baseball team not only in the history of the Yankees itself, but also of the whole Major Baseball League (MLB). Since then, no other baseball team has duplicated the 1927 New York Yankees’ formidable lineup, as well as their renowned feats on the field. It was the first time that the Yankees started to acknowledge their team name and their uniforms (although they were road uniforms). As you have noticed in the roster, they didn’t have any numbers on their uniforms, which were also devoid of any logos. 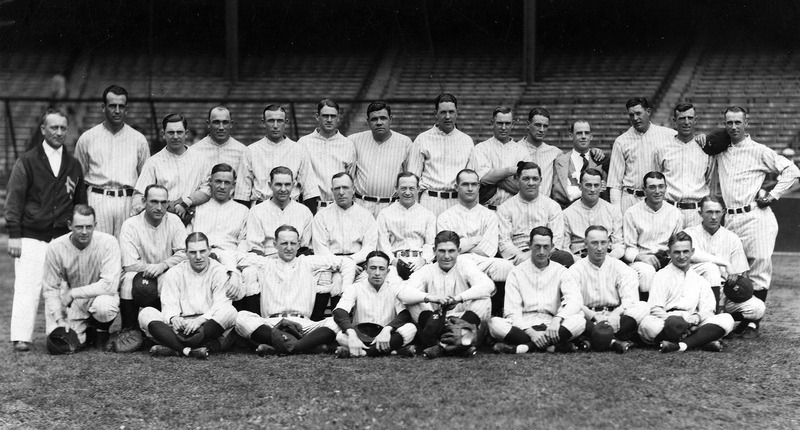 However, their caps were marked with “NY.” The Yankees played at their home turf, the Yankee Stadium, throughout the the season. Aside from his own doubts, Babe Ruth’s position as the top slugger was being challenged by his teammate Lou Gehrig. Gehrig actually scored ahead of Ruth’s total during the mid-season, earning many sports journalists’ favor. However, in the end it was Babe Ruth who emerged as the home-run king, hitting a total of 60 to Gehrig’s 47. And more importantly, it finally broke Ruth’s own 1921 home-run record. Ruth also enjoyed a remarkable last leg of the season by hitting 17 home runs in September; his 60th home run occurred on September 30, which also happened to be his team’s next-to-last game. Ruth’s 60 home runs were also his career-high for the season. Aside from those amazing numbers, Ruth also batted .356, drove in 164 runs and slugged .772. The Yankees wrapped the season with a whopping record of 110-44. They also won their fifth pennant, and finished 19 games ahead of the second placers Philadelphia Athletics. Then in the World Series, they swept Pittsburgh Pirates in four games, becoming the first-ever sweep of a National League team by an American League baseball club. During the Yankees’ banner season, the team also earned the nickname “Murderers’ Row” because of its feared first six hitters in its lineup: Ruth, Gehrig, Earle Combs, Mark Koenig, Bob Meusel and Tony Lazzeri. Despite the moniker actually being first coined in 1918 (the pre-Babe Ruth era) to the Yankees’ original sluggers, the nickname became eternally associated to the 1927 lineup.